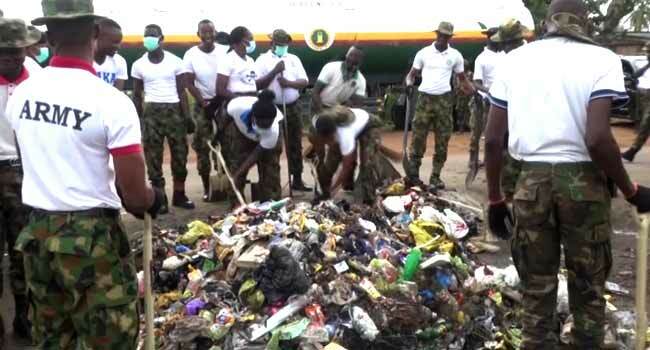 Soldiers and officers from various divisions of the Nigerian Army on Saturday took part in a clean-up exercise in Edo, Kaduna, and Borno states. The exercise, which is part of activities to commemorate the 2018 Nigerian Army Day, is to foster civilian-military relations across the country. The soldiers carried out general sanitation exercises, clearing dumps and blocked drainage systems in their host communities. In his address to mark the commencement of the event, the Chief of Army Staff Lieutenant General Tukur Buratai had assured Nigerians that the military would continue to carry out its duties in accordance with the constitution. Buratai, who addressed a press conference on Friday in Maiduguri, the Borno State capital, noted that while the security agencies have a duty to keep the nation safe, it is a collective responsibility that cannot be achieved without the support and conscious participation of patriotic citizens. “We assure all Nigerians that the Nigerian Army is for you and we’ll continue to work for the common good of the country while professionally carrying out our constitutional responsibility. I, therefore, solicit with us all to be our brothers’ keepers,” he had said.